Always got basketball on your mind? Love a swim on a hot summers day? Why not combine the two! Finding one of the best pool basketball hoops to suit your pool could be one of the best investments you’ll make. Not only is basketball in the pool extremely fun for kids, but adults can (and most likely will) take part in this. And yes, some of these will allow dunking. In this guide, we look at all the options you could possibly thing of – we will guide you through the best of the best here. We’re not here highlighting every single product in the market – just the tip of the iceberg that we consider worthy enough to be mentioned. If you need something for drier grounds, check out our best in-ground basketball hoops, or even portable basketball hoops to consider. As always though, PRICE, PERFORMANCE and DURABILITY are the main factors we take into consideration. A great gift idea for any basketball player with a pool! What are the Best Pool Basketball Hoops? Lifetime are no doubt one of the market leaders when anyone talks about basketball hoops. Doesn’t matter if it’s in-ground, portable… or when it’s for a swimming pool. In this case, the Lifetime 1306 is simply the best pool basketball hoop that we could find. All weather resistant, and backed with Lifetime’s 5 year warranty – this will survive being outside round the year. This poolside hoop is one that doesn’t require any tools to adjust the height and angle of it. It simply rolls out to where you want it, and play can begin. Adjustable from 4 1/2 ft right up to 7ft. Arguably, it’s just a small portable basketball hoop that you’d usually expect. The overall sturdiness is exactly as you’d expect though. The base is 27 gallons large – so fill it up with sand or water to get the maximum stability you can. If you’re happy with it’s stability, it can be dunked on! This is due to it’s large 44″ shatterproof backboard that is super tough and will withstand a dunk. Just don’t hold onto the rim. As with any basketball hoop that’s sturdy and complex – it does take some time to set up. Instructions are provided, and it can be a little annoying at first. But it will be well worth the effort. Another fantastic option, and one that offers anything you could possibly want for an in-ground basketball hoop – the Dunnrite Splash and Shoot isn’t something that comes cheap! The backboard is made with a large 43″ x 29.5″ Polyurethane material so it’s 100% friendly for the pool environment. Probably not the strongest backboard to dunk on heavily. Stability is also at it’s finest here too. The 25 gallon base can be filled with either water or sand, and ends up weighing up to 200lb. This is serious stability for such a small pool basketball hoop. What really stands out about the Dunnrite is the full sized 18 inch rim and telescopic pole that can adjust up to 56″. It just feels like an authentic and solid beast. The rim is made with stainless steel, and the pole is made with a powder coated aluminium. Rust should not be a concern, and the hoop will be able to brave all 4 seasons of the weather. We don’t recommend leaving it out though – the sun will typically wear away at the polyurethane backboard. One of the highest rated swimming pool basketball hoop on Amazon at the moment – you really can’t go wrong. Definitely one of the best in the market, and if you’re willing to pay the premium price, you’re in for a real treat. A fantastic option. 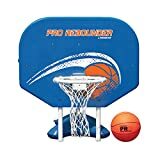 If you wanted a basketball hoop for pool and wanted something that doesn’t break the bank – the Poolmaster Rebounder Pro should be taken into serious consideration. First, the hoop does require assembly – and typically takes about 15 minutes to set up. It’s not difficult at all. Whilst it’s not the most durable hoop on the list, with the paint prone to peeling off over long periods of time, this should not deter you. This hoop provides exactly what you need though. It’s relatively inexpensive, but is made to withstand all four seasons. The rim itself is made is extremely durable in itself, and is supposed with polyethylene net that won’t thread away. It’s extremely sturdy – though we wouldn’t recommend dunking on it. The rim itself is NOT a break-away to withstand dunking. The base can be filled with either water or sand. Just note that the rim on this pool basketball hoop is smaller than other ones this list – sized at 14″. Another great product by Dunnrite, this is a little pricier. In saying that, this is definitely one of the best pool basketball hoops on this list. The Dunnrite Poolsport Basketball Hoop is an absolute ideal option for in-ground pools. The entire set up is made from an extremely durable and weather resistant polyethylene material. Whilst it’s an all-season hoop, we recommend storing it out of the sun when not in use. The pool side hoop is fixed – hence the reason it’s absolutely not ideal for above ground pools. Also means that it can be deemed to be slightly limited in it’s uses. Nevertheless, it’s super easy to set up – instructions are straightforward and takes about 10 minutes. The design is extremely stable and is made to last for years on end. The backboard provides a firm recoil, and the whole set up just feels tough. The only real downside, which can be avoided, is the rust that builds up on the rim. You’ll probably notice people have highlighted that the back of the rim begins to rust and seep down the front side of the hoop. But fear not! There is a solution. As soon as you notice the top slightly rusting, give it a small sand down and spray it with rustoleum. A small downside to otherwise a very very good pool basketball hoop. When looking out for a basketball hoop for pool, it’s obviously very important to look at the different factors that each product brings to the table. Whilst different products seem to have extremely similar backboard materials, be aware that there are some slight differences. High-Density Polyethylene (HDPE) is a wildly popular and highly used plastic. Both durable and tough – it’s the plastic of choice for most backboards. Alternatively, such as the Lifetime 1306, the backboard is made with a shatter-proof Fusion backboard made with Makrolon surface. Looks great, and will perform well in a wet environment. To be honest, all the products on this list are of high quality and show great durability. Accordingly, backboard material should not play too much of a role in your final considerations. This is definitely a much more important factor than considering the material of the backboard. Looking to the list of best pool basketball hoops, you can notice (even just by looking at the images) that there are a few different styles that hoops are structured. Either, the entire structure is made up with a plastic. Or alternatively, the backboard is held up with a pole – the traditional basketball hoop style. Take note of this. Typically, when the entire structure is made with one piece of high quality, durable plastic, then you are unable to adjust the height of the backboard. The traditional model is usually easier to carry around, but may be a bit more difficult to initially set up. On the other hand, having a larger, more solid structure however, allows the hoop to be filled up with more water. This makes the entire set up a lot more sturdy. Both have their pros and cons, so it’s important to choose accordingly. Water and metal. It’s inevitable that rust will come into the picture. Whilst most of the products on here claim that they will remain rust free for the entirety of their life – let’s be honest, it’s near impossible for that to be the case. In the event you want to prep well to ensure rust doesn’t creep in at a later stage, replacing all the nuts, screws, washers and bolts with stainless steel alternatives. A quick spray with a clear coat on top of the stainless steel bits and pieces usually does the trick as well. This will definitely minimise the potential for rust to occur. As for the hoops themselves – it’s a matter of keeping an eye out. As soon as you see surface rust, get a high grit piece of sand paper and do what you can to get rid of the rust. Spray over with rustoleum to re-seal the metal. This will ensure that your basketball hoop for swimming pool will last longer than just the one summer. But we iterate – it is near impossible to remove all potential for rust to occur. Where there’s water, the metal will always find a way to rust. As you can see from the above list of pool basketball hoops, there are a myriad of choices you can make. All we can say is please make sure you do your thorough research. Take into account the factors we have noted, as well as any you may have yourself. It’s an absolute blast having a basketball hoop for your pool, so we can safely say you won’t regret the investment. Of course, make sure you have a pool to start with! Looking at all the products, our Editor’s Choice and top pool basketball hoop on the market is the Lifetime 1306. It has everything you could possibly want in a hoop, and it’s made by Lifetime so you’re assured of quality. Have questions or want to tell us something? Please email us via our contact us page, or alternatively, drop a message down below. The First Whistle is a participant in the Amazon Services LLC Associates Program, an affiliate advertising program designed to provide a means for sites to earn advertising fees by advertising and linking to Amazon.com. The First Whistle Copyright © 2019.